Collaboration between the four NHS procurement hubs has resulted in the successful delivery of the first NHS Total Orthopaedic Solutions framework agreement, which will enable Trusts to better leverage spend in this key market. The four Hubs – the East of England NHS Collaborative Procurement Hub, the NHS North of England Commercial Procurement Collaborative; NHS London Procurement Partnership and NHS Commercial Solutions - have worked together as the NHS Collaborative Procurement Partnership to deliver this important initiative, which is the second joint project to come to fruition. 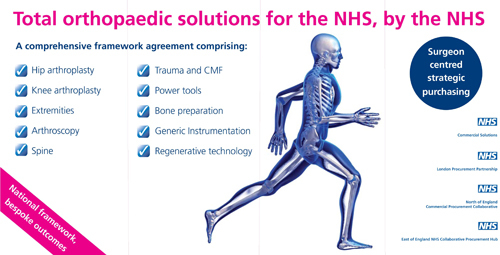 The framework agreement encompasses a huge range of orthopaedic solutions to meet the varying needs of all four hubs’ members. Working with the Hub to conduct strategic rationalisation and benefit from cost reduction, opportunities for value added services and improved efficiency. In May 2014, the NHS Collaborative Procurement Partnership launched the National Collaborative Framework for the Supply of Nursing and Nursing Related Staff, which is now being used by over 120 Trusts across England. A further collaborative framework agreement – NHS Total Cardiology Solutions – is on target for going live on 1st April 2015. Alyson Brett, Chief Executive of NHS Commercial Solutions said the project was an example of how the Partnership demonstrated best practice for NHS procurement.